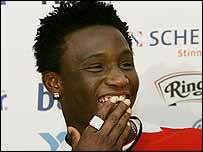 John Mikel Obi says he wants to sign for Chelsea - just a month after agreeing a deal with Manchester United. United and Norwegians Lyn Oslo lodged a complaint with Fifa over Chelsea's pursuit of Obi on Wednesday after he said he was forced to sign for United. In a bizarre interview with Michael Crick on BBC's Newsnight, 18-year-old Obi claimed he had never wanted a move to Old Trafford. And he said Chelsea know they are the only club he wants to join. Obi agreed a move to United on 29 April, but since that time has performed a U-turn, insisting he had been bullied into agreeing the switch. It is a claim furiously denied by United chief executive David Gill and Oslo's sporting director Morgan Anderson. They have both signed the documents that are on their way to Fifa's headquarters in Zurich. Transcript of interview on Newsnight, BBC2, 19 May. Michel Crick (MC): Do you want to play for Man Utd? John Mikel Obi (JMO): No. JMO: (laughs) because I don't want to. MC: But you signed for them? MC: Why did you sign for them? JMO: I don't know, something happened, you know. MC: What was the something? JMO: No, no, no. I don't want to play for them. MC: Do you want to play for Chelsea? MC: And why do you want to play for Chelsea? JMO: Because I love Chelsea. JMO: Yeah. And I'm going to be happy when I'm there. MC: Right. And have you spoken to Chelsea about this? MC: They know that do they? MC: Can you give me a clue as to why you changed your mind? JMO: No, I never wanted to play for United. MC: You never wanted to play for United? MC: Why did you sign for them then? JMO: I was forced to. MC: What forced you to sign for them?